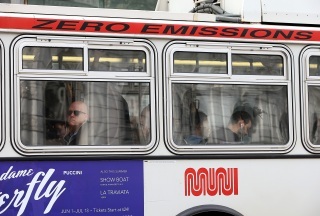 A San Francisco Municipal Railway construction inspector was hit by a truck near the corner of Van Ness Avenue and Chestnut Street this morning, a Muni spokesman said. The collision occurred around 8 a.m. involving a truck that doesn't appear to have been a Muni vehicle, according to agency spokesman Paul Rose. The construction inspector was taken to a hospital and was conscious but in serious condition, Rose said. More details about the case are not available at this time.